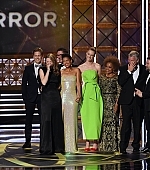 Gugu attended the 69th Primetime Emmy Awards yesterday with the the cast and creative team of San Junipero where the episode won 2 Emmys for Best Writing for a Limited Series, Movie or Drama & Outstanding Television Movie. Gugu looked amazing in a custom lime green sequinned gown from Hugo Boss. Head to the gallery to check over 100 photos of Gugu from last night.